Entertainment for Grownups – Hi-Fi, Home Theatre, Music, Movies, TV & Film, Gaming, Gadgets and more! 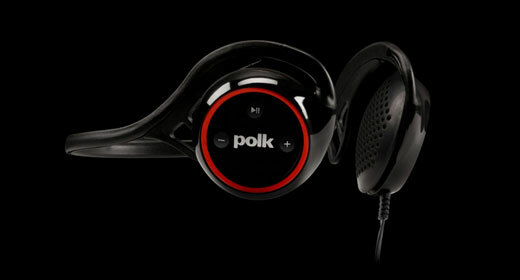 This Polk Audio headphone knows how to act the tough guy when it comes to robust lifestyles. SPORTS EARPHONES PLAY a big part in my life seeing as I’m in a gym at least four times a week, usually more. For years, my “sports earphones” were whatever set I had lying around that I wasn’t too attached to. As I said in this review of Polk Audio’s more upmarket Ultrafit 3000 in-ear ‘phones, audio gear used in a gym has a hard life and usually goes out in a blaze of glory well before its time. So the budget numbers chucked in the box with my various MP3 players had to do the job. Then the audio manufacturers saw a niche market and the sports earphone was created and I was intrigued. Some sports models were nothing more than standard ‘phones with a bright colour scheme. Other ‘phones however, were given more attention and tweaked to offer a more secure fit, water resistance or even in the case of some Sony models, a complete built-in MP3 player so that cable chaos became a non-event. 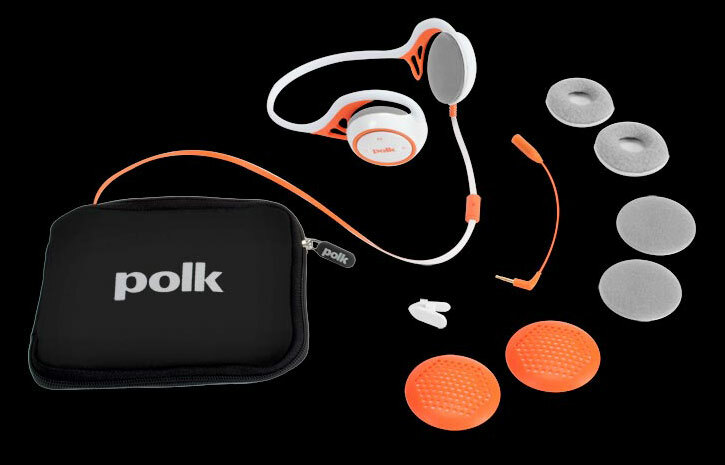 Polk Audio’s Ultrafit series is aimed at sporty people, and everything from the design ethos to the packaging shows this. The Ultrafit 2000 model is an on-ear type headphone with a band that’s designed to be placed behind the head. This makes them ideal for users who don’t like in-ear ‘phones or those who want to be able to hear more of their surroundings. The headband design makes for a secure fit but initially, I couldn’t quite get comfortable with the Polks, with my ears feeling squeezed between the band and the earpads. I had a brainwave and pulled off the removable “wings” and suddenly, I was much happier. They were far more comfortable, the loss of the “wings” seemed to make no difference in terms of a secure fit, and the Polks really did stay in place even when I was moving around quite aggressively. The sporting inclination is also seen in a reflective surface on the headband, tangle free Kevlar core cables (and they really are pretty much tangle free), heavy-duty connections and a moisture resistant coating. The 2000’s support Apple’s iPhone/iPod remote control and have a microphone on the cable with controls on the right earpiece. This means that button-pushing must be done blind but it doesn’t take long to get used to the system, and the three indentations make it easy to find the desired control every time. In an active environment, this is a great feature, assuming you’re an Apple user crazy enough to take an expensive product into a potentially destructive area. Like the Ultrafit 3000 models, the 2000’s are shipped with a decent pack of accessories. You get: headphones, protective case, Nokia connection adaptor, 104.1cm cable with three-button remote control and mic, two pairs of foam ear pads, one pair of cold weather earpads, one pair of silicone earpads, and a shirt clip. The sound of the Ultrafit 2000’s is subject to the same problem as many in-ear ‘phones – the fit, which is odd in an on-the-ear style headphone. Because the band is placed at the back of the head, the ‘phones don’t just happily end up flat against the ears, which means that bass can disappear, literally into thin air, leaving them to sound thin and flat. Fortunately, a bit of bending and tweaking got the earpads fitting quite well and from then on out, I never had to adjust them again. Holding the earpads against the ears always improves the fit and ekes out the last bit of bass, but it’s obviously not practical to wander around with your hands on your head. The good news is that once the ‘phones are more or less properly orientated, they sound good. The large drivers make for plenty of bass, which isn’t bloated or loose, rather it’s well-defined and easily capable of carrying a pounding bass track from gym-style bands along the lines of Rage Against The Machine, Audioslave or NIN. The overall character is similar to Polk Audio’s Ultrafit 3000 (quite warm and generous in the bottom end) but here, the treble isn’t rolled off but instead you get obvious without being obnoxious. There’s a touch of edginess to the high notes but it’s by no means obtrusive – think slightly bright metal dome tweeter instead of mellow silk dome and you’re in the ballpark. In an active context, this is no problem at all and it’s well suited to the type of powerful music on my training playlist. Noise isolation is marginal to non-existent as expected from this type of design, which is a blessing for runners, walkers, cyclists and others who insist on training outdoors, but it does mean that the volume control becomes your good mate when you’re trying to shut out the world. The 2000’s can easily generate and sustain high volume levels without breaking a sweat (ha! ), which is a good thing if you have to drown out the yowling spin class instructor upstairs. The Polk’ don’t keep noise out but they also don’t keep it in, so if you’re cranking your “fresh beats” while puffing away on the exercycle, the lady on the next one might get really tense when she hears metal, rap or rock leaking from your ‘phones. The same applies on the bus or in the office. This is something to consider if you care at all about your fellow man. As an aside, call quality was very good when I used these ‘phones with my iPhone and according to the people on the other end of the line, the mic seemed to be doing an excellent job of picking up my voice and not too much else. I’d like to see multiple cable lengths supplied with these ‘phones to give users a choice of where they wear their music players without having cable draped everywhere but all up, that’s the only moan.